Two seasons ago, Vancouver looked like they had acquired an important part of their future when they picked up winger Nikolay Goldobin from San Jose in advance of the 2017 trade deadline in exchange for winger Jannik Hansen (who is currently an unrestricted free agent). Fast forward to today and it’s certainly looking like he could already be on the outs with the Canucks. Last season, the 22-year-old split the season between Vancouver and their AHL affiliate in Utica. At the minor league level, he was quite productive, collecting 31 points (9-22-31) in 30 games. However, that wasn’t the case with the big club as he had just 14 points (8-6-14) in 38 games while playing just over 12 minutes per game. He’s a player that has outplayed the minors but has yet to really make his mark in the NHL. With the retirement of the Sedin twins and their recent struggles, it looked as if Vancouver was going to be willing to play more of their younger players. But then they went and acquired an entire bottom-six line in free agency with the additions of wingers Antoine Roussel and Tim Schaller plus center Jay Beagle. Those players didn’t get signed to sit on the bench so they’re going to be in the lineup on a regular basis while rookie forwards Adam Gaudette and Elias Pettersson stand to be ahead of Goldobin on the depth chart and get the spots earmarked for the youngsters. All of a sudden, he’s on the outside looking in. It stands to reason that he could be 15th or 16th among forwards on Vancouver’s depth chart heading into training camp. While it’s certainly possible that there could be some injuries up front in the preseason, there probably won’t be enough for Goldobin to move into an end-of-roster spot (let alone a regular spot in the lineup). Further impacting things is his waiver situation. Although he is still on his entry-level contract for one more year (with a $832K cap hit plus $212K in performance bonuses), Goldobin now must go through waivers to get back to the minors next season. Considering he’s only four years removed from being a first-round pick (27th overall in 2014), there’s a very good chance a team would put in a claim for him so going this route is off the table as well. They can’t send him down and it’s improbable that there will be a roster spot for him at the start of next season. That leaves a trade as the best possibility both for him and the Canucks. What should Vancouver be looking for in a return? They have good forward depth and the same can be said for their back end. They don’t really necessarily need to add someone else on the cusp of making it to the NHL on a full-time basis. That puts a draft pick or prospect (if signed, still waiver exempt) as the best option for them. Of course, other teams know that the Canucks are in this situation with Goldobin so it wouldn’t be surprising if offers aren’t exactly top notch. 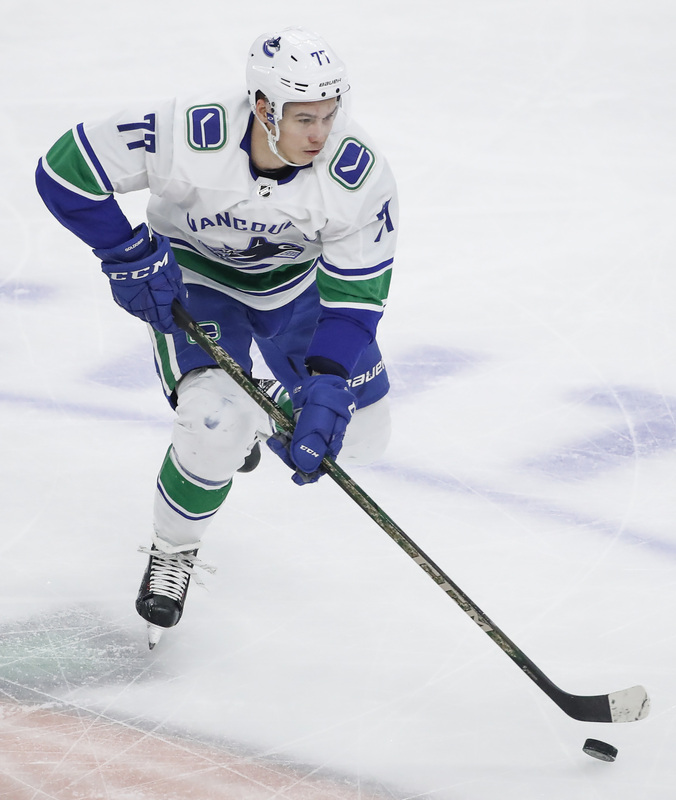 In his limited time as a professional, Goldobin has shown some flashes of top-six potential. It wouldn’t be shocking if he gets to continue to show those flashes in a different uniform for 2018-19. Would not mind Montreal taking a shot at him despite already having an over abundance of wingers on the roster. Interesting guy for the Rangers but I don’t think they are looking to trade draft choices or that Vancouver would want someone like Spooner.